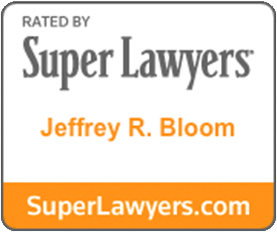 Jeffrey R. Bloom is a civil litigation and trial attorney who represents injury victims in Maryland and Washington, D.C. Prior to founding his own law firm, Mr. Bloom was associated with a highly regarded firm in Montgomery County, Maryland renown for having some of the best trial lawyers in the State of Maryland. During that association, Mr. Bloom focused his practice on personal injury and civil litigation generally. Over the past decade, Mr. Bloom has obtained substantial judgments, jury verdicts, and settlements in favor of his personal injury clients. He litigates cases involving severe injuries such as post-surgical infections, displaced fractures, ligament damage, nerve impingement, herniation, and spinal compression fractures. He also prides himself on maximizing his client’s monetary recoveries in non-catastrophic injury cases involving soft-tissue and whiplash injuries. Mr. Bloom has tried in excess of 200 cases before judges and juries in Maryland and District of Columbia courts. Please contact Mr. Bloom at (240) 499-8804 or jbloom@jrbfirm.com.